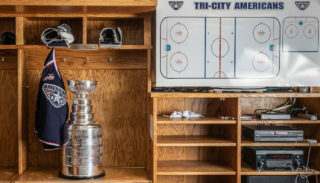 Toyota Center, Kennewick, WA 7:05 p.m.
Local Radio Broadcast: NewsTalk 870 AM, 6:45 p.m.
After a big win last night, the Tri-City Americans look to even the series with a win in game four of the Western Conference Quarter Finals. Despite losing six out of seven meetings against the Kelowna Rockets this season, the Americans lead the all-time series with a record of 63-58-2-1. Myles Bell- Bell began the Rockets’ third period rally last night, with his third goal in as many games during the series. The forward leads the team with four points during the post season, following the regular season where he tallied 42 goals and 35 assists for a team best 77 points. Marek Tvrdon- Tvrdon has registered points in all three games during the series, checking in with his first goal late in last night’s game. The Slovakia native is tied for second on the team with three points during the playoffs, tallying an assist in each of the first two games. Justin Kirkland- Another player scoring his first goal of the post season last night was Justin Kirkland, who momentarily got the Rockets within a goal in the third period. The Alberta native was a consistent secondary scorer for the team in the regular season, registering 17 goals and 31 assists. Eric Comrie- Comrie has not disappointed in his first three career playoff starts, including a dazzling 52-save performance last night in game three. The Alberta native finished the regular season with the league’s second best save percentage at 0.924 and has only improved on that in the post season with a 0.941. 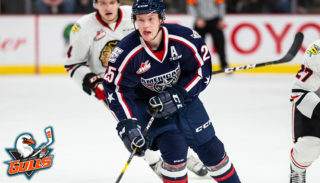 Phil Tot- Another player rising to the occasion in his first WHL Playoff experience is Phil Tot, currently leading the team with five points. The 20-year-old has registered goals in each of the last two games while assisting on the game winning goal last night. Brian Williams- After a slow finish to the regular season, the Americans’ regular season scoring leader has started to heat up again, registering four points, including two goals during the series. The California native was a big part of the team’s 4-3 victory last night, registering a goal and an assist. Game #3 Recap: Riding a 52 save performance by Eric Comrie on Tuesday night, the Americans built a 3-0 lead after 40 minutes and held on despite a big third period push from the Rockets. Jessey Astles, Phil Tot, Brian Williams and Justin Gutierrez scored for Tri-City as it knocked of the CHL’s top ranked team 4-3 at the Toyota Center. Top Series Performers: In his first career playoff series, Phil Tot currently leads the team with five points, scoring goals in each of his last two games while picking up three assists in the series. Brian Williams has also scored two goals in the first three games, while Gutierrez and Bowles have each added three and two goals respectively. Home Ice Advantage: Through three games in the series, home ice has been key with each team winning its respective home games. The Americans finished the regular season with a 19-14-1-2 record at the Toyota Center and will look to use that home ice advantage to even the series tonight. Eric Comrie Breaks Single Season Saves Record: With 46 saves against the Portland Winterhawks on March 11, Eric Comrie set the Tri-City Americans all-time mark for saves in a season. The previous record was set by Aaron Baker during the 97-98 season where he made 1,825 saves. Comrie finished the season with 1,849 saves in 60 starts, an average of 30.82 saves per game. 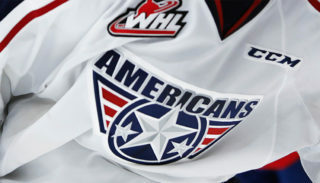 Topping and Comrie Receive WHL Honors: This past week, two Americans’ players were honored with 2013-14 WHL accolades. 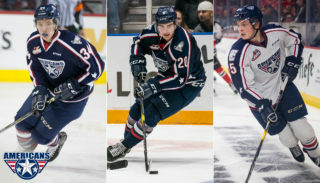 Eric Comrie was named a second team Western Conference All Star and captain Mitch Topping was named the Western Conference Humanitarian of the year. It was the second time in as many years that Topping had earned that honor and he will be a finalist for the 2014 Doug Wickenheiser Memorial Trophy. Comrie Saves for Hunger: Americans goaltender Eric Comrie has teamed up with 2nd Harvest Tri-Cities to re-launch “Comrie Saves Hunger” for its second season. Comrie will donate 50 cents out of his own pocket for every save that he makes on home ice. The Tri-City Americans will also match Comrie’s donation to 2nd Harvest dollar for dollar. Comrie finished the regular season with 951 total saves at the Toyota Center coming out to a grand total of $475.50 in his personal donation.